I awoke this morning to find the world out of kilter. To begin, there was white powdery stuff outside. Snow in spring? In suburban Melbourne? Strange. 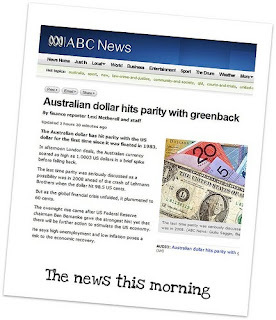 Then there was news that at the stroke of midnight, one Australian dollar had bought one US dollar. Parity? Fabric bargains online? Strange. And then Mr HB said he must learn how to use the sewing machine. What the alright???? What on earth is Mr HB up to? Completely mad. That's it. I'm taking my cardboard box of supplies and heading into the bunker until normality returns. 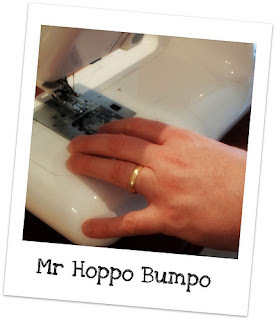 Surely there's a law against Mr Hoppo Bumpo using your sewing machine? Does that mean you are allowed to us his dropsaw and nail gun? does this mean it's a good time or a bad time for you to buy yourself a lottery ticket? I knew it was a strange day when I woke up and now you have confirmed it for me! Wow you did indeed have a very strange day. Somehow we managed to miss getting any of the white stuff although we did have hail late last night. These are the first signs of the apocalypse if you ask me! 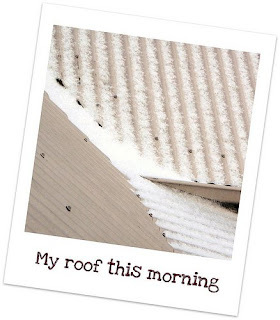 The first one is pretty scary (snow in Melbourne suburbia?! In October?! ), but those last two are actually pretty cool! I am so pumped about the dollar I cannot begin to tell you! hello etsy fabric!! woot woot!!! is Mr HB any good on the machine? ... and what is the Mr. sewing??? and I had a good nights sleep. And I thought it was just the UK that was getting some funny weather! Being October, we should be getting Autumn like weather - hurricane force winds, rain, more rain and just for good measure a little bit of ... rain. What we have is glorious sunshine, unbroken, clear blue skies and 22 degrees celsius!! We don't even get that kind of weather in July!!! We're usually only half way through our rainy season by then. Definitely something strange going on. I still don't believe in Australian snow. I think it must be fairy dust, which would explain the other mystical events wouldn't it. You know how sometimes you have dreams, and you do not KNOW they are dreams until something makes you think back on it...and you realize it never actually happened?